I made it until the ball drop in New York on New Year's Eve. That was eleven o'clock in our time zone. 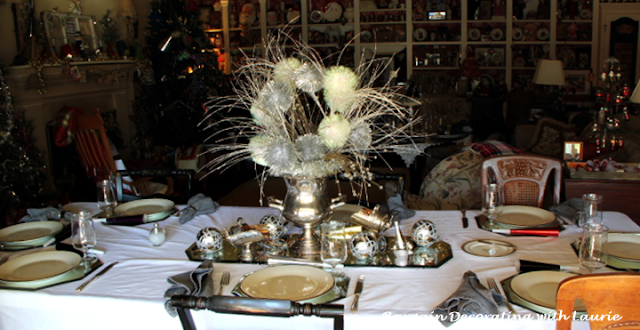 This table setting was for our New Year's Day dinner when we make sure we eat all those good luck foods. Mirrors served as chargers for our Lenox Moonspun dinner plates and Lenox Moonspun goblets. 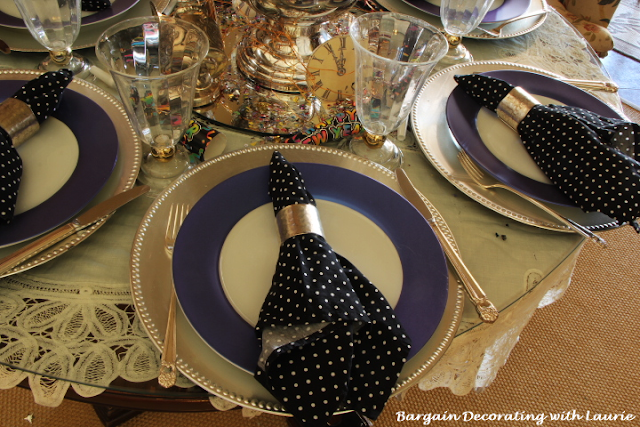 Each place setting was topped by a horn in case we wanted to get wild with our celebration. 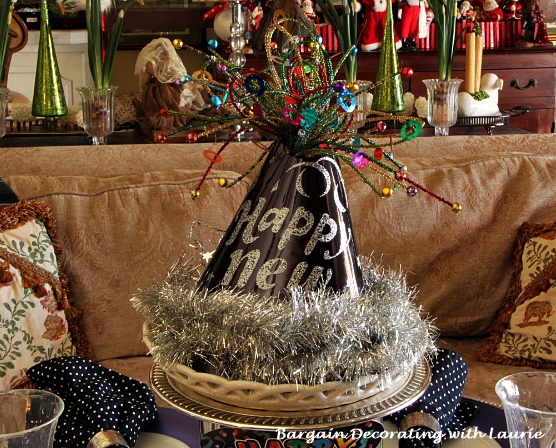 If you saw our previous post about our New Year's trees and mantel, you probably noticed that I think New Years decor should be a little lot wild, so that may explain this centerpiece in a champagne bucket. This little champagne bottle serves salt and the ice and the bucket serves pepper. That's my granddaddy's watch on the corner of the mirror. 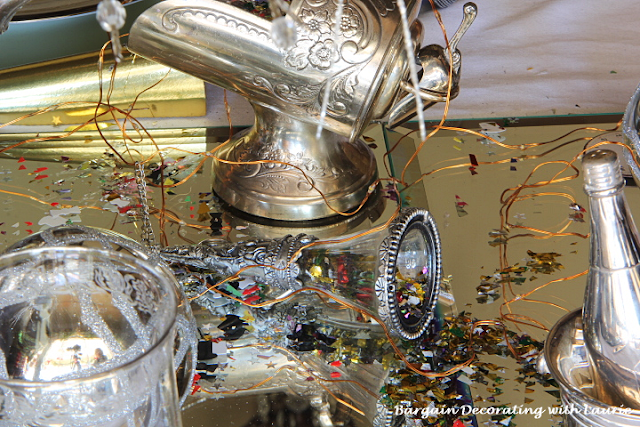 Sugar scuttles served confetti (they also hid the battery pack for the little lights in the centerpiece). That's my grandmother's watch on the corner of this mirror. In our daughter's wedding, the mothers and grandmothers carried tussie mussies. 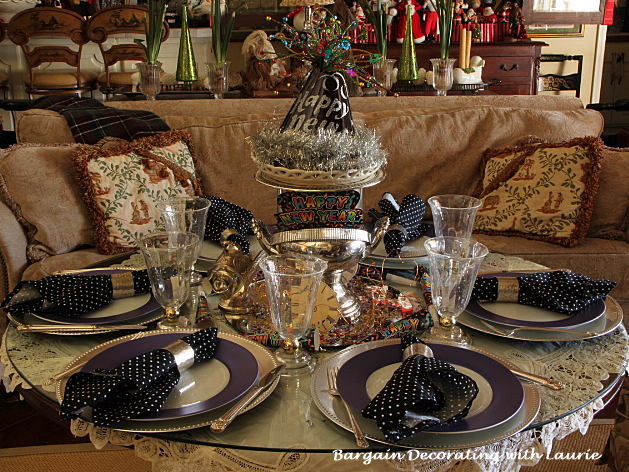 I filled mine and my mother's with confetti for this table. This is the children's table for our good luck dinner. 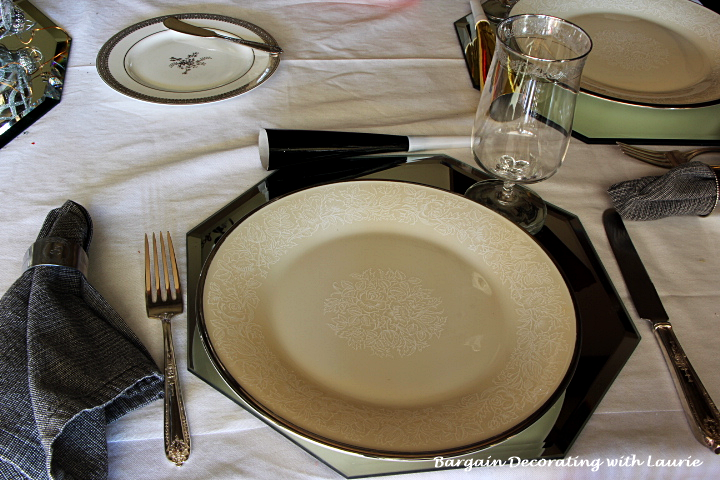 I used silver colored chargers under the plates (Snowflake by Noble Excellence). The children's goblets are plastic. 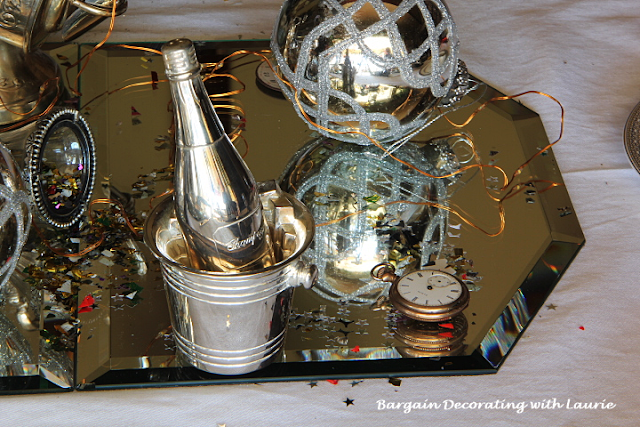 A champagne bucket on a mirror centered their table. Another wild creation topped the bucket. 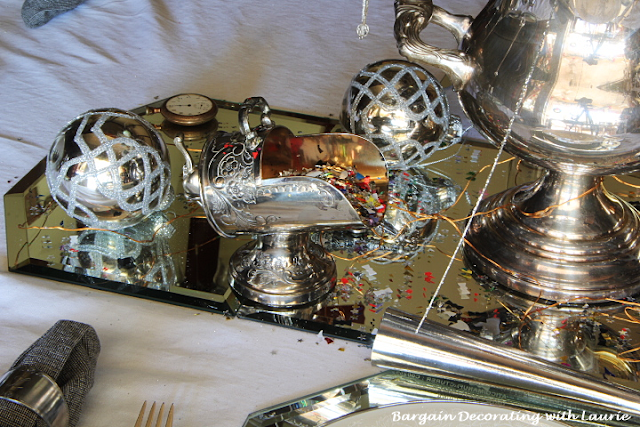 Yes, I'm crazy enough to put a confetti-filled sugar scuttle and horns on the children's table! Yes, we had a wild New Year's Day celebration! It looked wonderful. 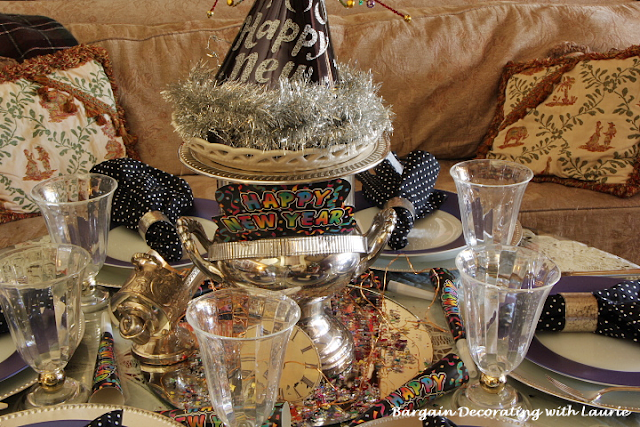 My hubby and I were both sick for New Years so we did not celebrate, but we seldom do. My hubby is a creature of habit and goes to bed very early every night. In fact, he and one of our pups go down to the bedroom to "wink wink" watch a game or a race or something else. The "wink wink" means that they go down for their prebedtime nap. This is not going to change any time soon as we have been married almost 52 years. I loved your New Years table. 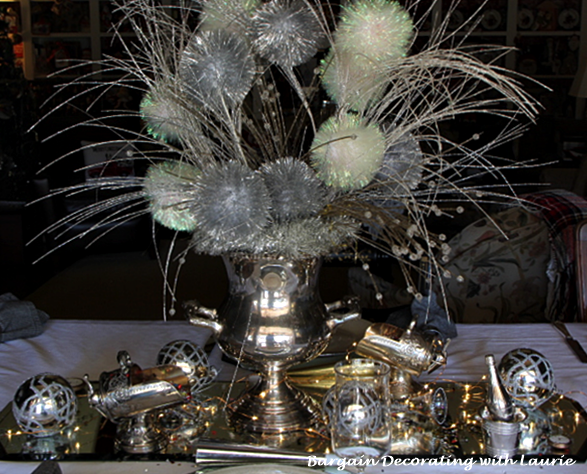 I still have not touched my Christmas decorations. It will be so dark when they are gone. My hubby welded me a frame for a sleigh that we set out in the front yard. When it began to snow last night, I turned the lights on the sleigh and reindeer. It was so pretty. We won't give up the decorations until after January 6, but I have plans to take every ornament down and repackage things so that I can donate part of them, throw some broken things away and make more room in my attic. Love both of your tables - if you can't go wild for New Year's, when can you? 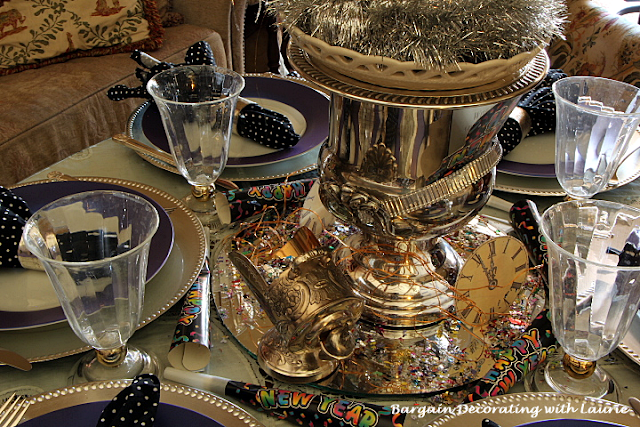 Loved the use of champagne buckets for the centerpieces. I bet the children felt very grown-up with theirs! You must share the "good luck" foods -- I'm sure we could all use some luck in 2018. 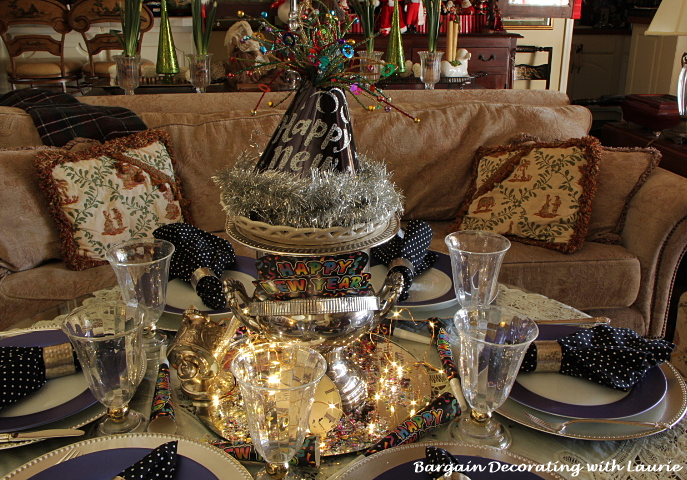 I love your New Years decor. You go all out and it looks so beautiful. What are tissue mussies from your daughter's wedding?